Crews worked quickly Thursday to tear down the 12-unit complex at 330 Esplanade. It's been a long time coming. 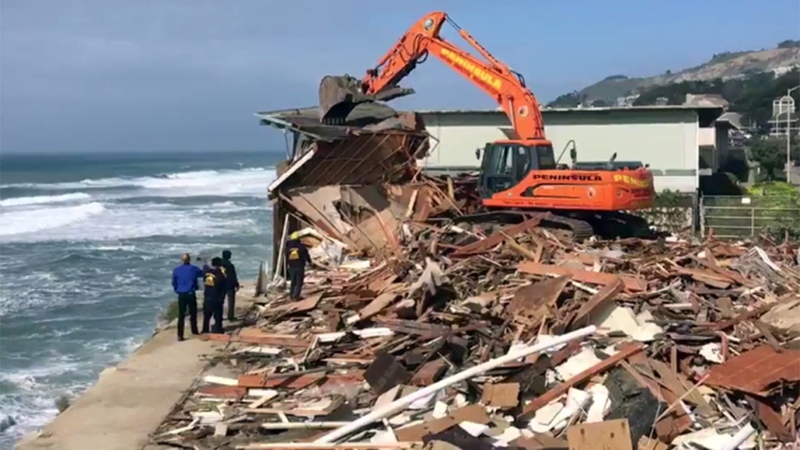 After sitting vacant for six years, a red-tagged apartment building teetering on the edge of the cliff in Pacifica has been demolished. The building is steps away from 310 Esplanade, the complex that was yellow-tagged last month. Many neighbors said Thursday they are glad to see it go. Demolition crews worked quickly Thursday to rip down the 12-unit apartment complex at 330 Esplanade. Sonja Thompson lives steps away from the now-demolished building that's been sitting vacant since 2010. "It needed to go," she said. Neighbors say homeless people have been living in the units. And Pacifica city leaders say they've been urging the property owner to demolish the building and were prepared to use taxpayer dollars to take it down if Esplanade, LLC didn't act soon. Last month, 40 people who lived down the street were forced to move out after the city yellow-tagged their building for the same reason that doomed this property: huge waves undercut the cliff edge. Thompson said she knows that one day the city will likely be tearing down her oceanfront apartment. "Eventually all of this coast will be gone," Thompson said. "It's a great place to be while we're here." NBC Bay Area reached out to the property owner of 330 Esplanade and the two buildings next door to hear they plan to do with the properties but did not hear back. The city says, if those neighboring buildings become a danger to the public, they will pay for the demolition.